Stampin’ Up! 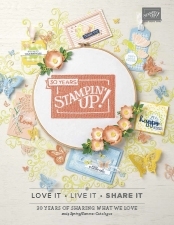 has created the Share What You Love Suite and put the products in perfect bundles as a tribute to every crafter who have made and continue to make, Stampin’ Up! the perfect centre for creativity and friendship. We have three exclusive early release bundles for the share what you love suite which is released to customers on 1 -31 May. This month Stampin’ Up! Demonstrators around the world can preorder exclusive products from this brand new suite. Have a look and see which bundle is right for you. These can be ordered from my online shop from 1 May. You will not want to miss out on this opportunity as these bundles will only be available between 1-31 May and the FREE gifts are only included in the bundles! …and then check out the bundles for yourself by clicking the picture below to open a full-size PDF! Check back soon as I will show you some more once my demonstrator order has arrived. I look forward to sharing the product suite with you.